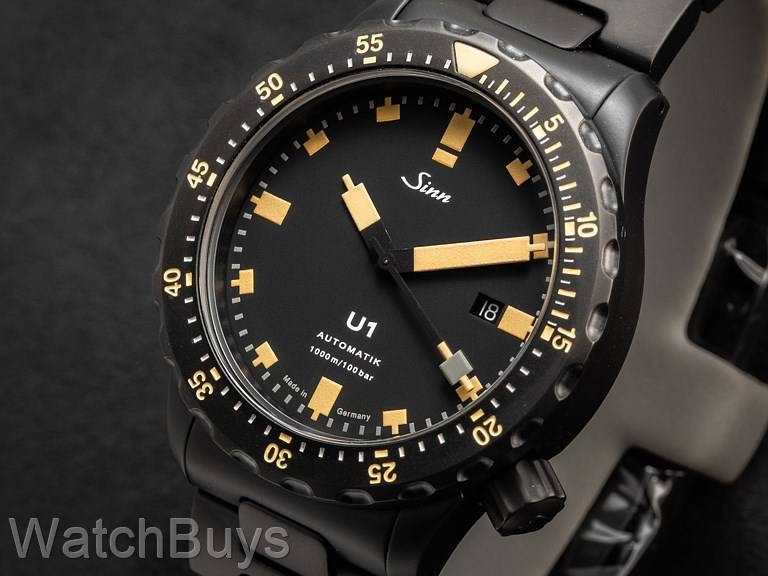 One of the most popular Sinn limited edition watches in the last few years was a fully Tegimented, all black PVD version of the Sinn U212, with the official title Sinn U212 SE. We remember the watch well, as it was a knockout in person and one that we continually pestered Sinn for additional pieces since our initial allocation sold out in the first two days. 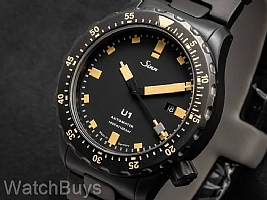 The only criticism of the Sinn U212 SE was that for some people it was too big as it featured a 47 mm case. Sinn has now responded to the many requests to create a watch drawing inspiration from that original design but in a smaller case size of 44 mm, and we are now proud to present the brand new Sinn U1 SE black with a fully Tegimented case on a fully Tegimented bracelet. The new Sinn U1 SE changes the original design of the classic Sinn U1 by adding a fully Tegimented PVD black case and a new dial, bezel and hands, which like the Sinn U212 SE feature SuperLuminova in an ivory color. The new Sinn U1 SE on black bracelet features the same great case design made in-house from German submarine steel at Sinn's case making facility in Glashutte, Germany. Once the case is complete, the Tegimenting process begins, and when we say "fully Tegimented" we mean what we say - case, crown, bezel, case back and even the anti-reflective coating. The international testing lab of Germanischen Lloyd has tested the Sinn U1 SE on bracelet, and determined that the watch can be certified as water resistant to 1,000 meters. This same firm tests submarines for their ability to withstand the effects of underwater use. Verified Owner Comments: After receiving this watch17 days ago, the accuracy is <+2s per day. The bracelet is extremely comfortable. The fit and finish is excellent. The uniqueness of the appearance is unlike any other watch. It is not a Clone. It is what it needs to be. Nothing more, nothing less. I Love It! This watch is everything I expected and I am truly proud to finally own a Sinn. Verified Owner Comments: Just received my Sinn U1SE love it. Of course time will tell just how accurate it is. The bracelet is excellent. I had no problem removing one link for a tighter fit. For a big dive watch I especially like the way the subdued dial and bracelet makes it look a bit smaller than it really is. I travel a lot and wanted a good watch that would not attract attention. Watchbuys is an excellent company to deal with. They were helpful in my selection and delivered the watch quickly and securely. Verified Owner Comments: The first Sinn in my collection and my new favorite watch. As a fan of heavier watches, given my large wrist size, I found the U1 to be the perfect fit. I highly recommend the bracelet.